Since Amazon started taking pre-orders for The Eighteenth Green, and I followed suit for autographed copies, people have asked about the process. What if I change my mind and no longer want the book? What if I get the book and don’t like it? What if I want to give it as a present, but it doesn’t go out in time? Why not wait until the book is out before taking orders? The first questions are easy. Every one of the autographed books sold through my website webbhubbell.com comes with a guarantee. If you want to cancel or don’t want the book after you get it, I will issue a full refund. No questions asked. I can’t speak to Amazon’s or B&N’s return policy, but mine is absolute. Don’t want the book, you get your money back. As to why offer pre-orders the answer is two-fold. A pre-order puts you first in line. When I get my books from the publisher they go out to the pre-orders in the order of their receipt. Usually this happens weeks before the books are available on Amazon or at bookstores. Pre-orders also give me a good idea how many books to initially order and to buy the supplies that go into shipping out the books quickly. I cannot begin to describe how helpful pre-orders are, but they are and mean a great deal. If you are curious about other aspects of getting The Eighteenth Green out please right a comment and I will get right back to you. Don’t need an autographed copy Amazon is taking preorders at https://www.amazon.com/Eighteenth-Green-Jack-Patterson-Thriller/dp/0825308852/ref=sr_1_6?ie=UTF8&qid=1526571422&sr=8-6&keywords=webb+hubbell+books. I hope y’all are as excited as I am. I will keep you posted. Speaking Opportunities: In 2017, my calendar was filled with speaking engagements around the country. I spoke to law schools about special prosecutors, at churches about the life changing and spiritual experience of spending time in prison, to civic organizations about the importance of organ donation, to business groups and colleges about My Journey Without Maps, and literary and library groups about writing novels. Contact me at [email protected] to arrange for me to speak to your organization or institution. I also love to talk to book clubs and community groups in the Charlotte area where I live. I just booked a new book club appearance in July and am excited to meet with the group and talk about Jack Patterson. 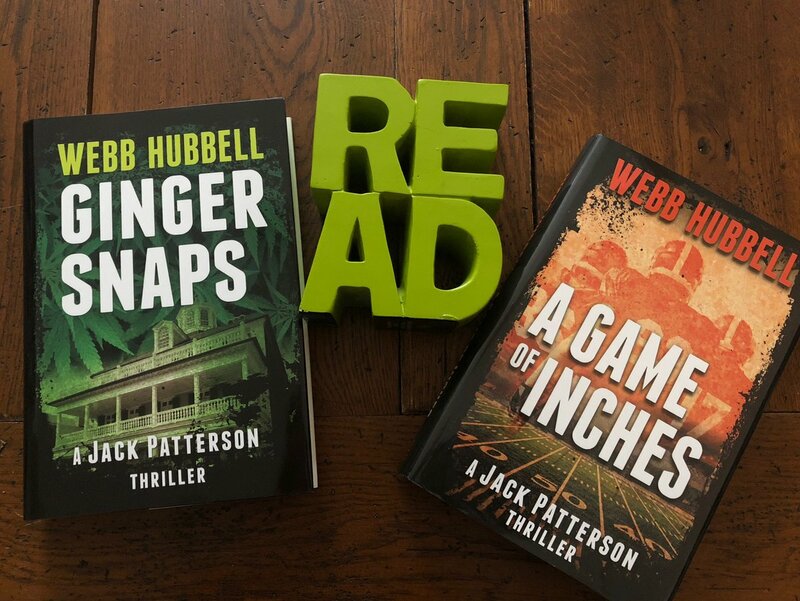 Books: There are still plenty of copies available for purchase of the award-winning Jack Patterson Thrillers, including A Game of Inches. They are available for birthdays, thank you gifts, and just to be nice presents. Autographed copies are available at my website, webbhubbell.com. Amazon and Barnes & Noble are also selling hard copies and eVersions, and local independent bookstores either have them in stock or can get books from my publisher, Beaufort Books. If your favorite bookstore has run out, ask them to order your books today.